Growing preference for non-invasive and minimally invasive cosmetic surgical procedures coupled with biopharma innovation in treating skin diseases is the new trend observed in the dermatology space. Value addition by introducing new and effective skin treatment products has been the main focus area of various derma companies. Advances in cosmetic surgical procedures have led to introduction of less- trauma skin treatment procedures that are gaining high traction across hospitals, dermatology clinics and beauty clinics. Such is the case with Crow’s feet treatments that include a range of cosmetic solutions such as Botox, dermal fillers, topical creams and chemical peels. Higher rate of smoking and ultraviolet exposure are the main factors causing crow’s feet which is being witnessed on a large scale. 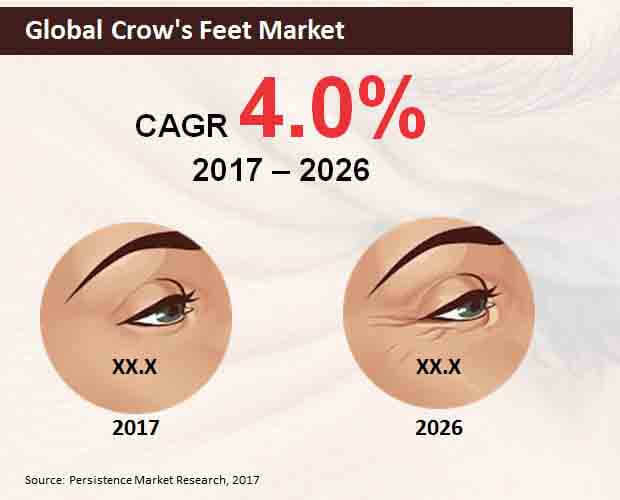 The demand for cosmetic products and solutions to treat crow’s feet is expected to increase at a moderate rate, according to Persistence Market Research analysis. The global crow’s feet market is projected to expand at a value CAGR of 4.0% throughout the period of analysis. This expansion is the result of early onset of ageing that is pushing the use of age defying treatments. As per World Population Report by United Nations, the global population is aging at a faster rate, especially in Europe and United States. This early onset of aging is driving individuals to apply cosmetic solutions and anti-aging treatments to reduce skin disorders and other skin related problems such as crow’s feet. The adoption of crow’s feet treatment is also triggered owing to increased life expectancy of individuals owing to the “don’t want to look old” trend. In addition, world population is more reliant on non0invasive or minimally invasive procedures that cause less trauma. The demand for less painful cosmetic procedures has made it imperative for dermatologists to come up with effective topical solutions than surgical procedures. Consequently, this is expected to drive the need and sale of crow/s feet treatment in the years to follow. With advances in dermatology science, several minimally invasive solutions have been developed for treatment of crow’s feet. Botox treatment is one such minimally invasive procedure that has gained high steam since past years. Botox is highly efficient cosmetic treatment that includes injecting Botulinum toxin that temporarily paralyses muscle activity. This type of treatment is safe and the effect lasts for more than two years, according to medical research. The demand of Botox for crow’s feet is expected to grow at a rate of 4.1% during the analysis period. According to research report, the revenue generated from Botox treatment is estimated to reach a higher value as compared to other treatments. Manufacturers involved in development of minimally invasive cosmetic procedures are striving to enhance the effectiveness of their products by introducing novel therapeutic solutions. For instance, Allergan’s onabotulinum toxin gained high recognition as minimally invasive aesthetic procedure across several countries. Manufacturers have also partnered with local biopharma players and research institutions to innovate and develop their existing product line. Players involved in crow’s feet treatment are Allergan, Inc., Alma Lasers, Cynosure, Lumenis (Pologen), Sciton, Inc., Venus Concept Canada Corp., Galderma S.A., Merz Pharma GmbH & Co. KGaA, and Myoscience, to name a few.